TILOS software was originally developed with 2 major road building companies in Germany to provide a comprehensive planning tool not only for major road projects, but also for small and medium size projects. Road construction is characterized by repeating the same type of work in different locations. In the TILOS task library, all company specific activities can be created and modified on demand if required. Creating new activities on the plan is as simple as selecting the appropriate task template and drawing the task at the new location. TILOS calculates the quantities using simple the length of the tasks, or in the advanced mode, uses a profile that specifies the quantities along the location for the activity. The description, color and shape are automatically set by the task template. Enhanced features, such as bulk creation of the tasks at different locations reduces the planning time to a minimum. Planning road repair and widening projects need more care as at any time, the traffic needs to be kept running. Some of the lanes are blocked while traffic is re-directed to other lanes. The project needs to be divided into different phases. The orange section is under construction, where no traffic is allowed; violet and green show traffic moving in both directions. For each state, a separate plan is done for the construction work. The complete plan shows the work for phase 2, where multiple crews are doing the same work in different locations to minimize the impact on traffic flow. In the final phase, the plan shows the paving crews moving from left to right. In the following sample TILOS is used to generate the master program for a new highway project in combination with other planning systems. The linear part of the project, such as clearing, earth movement and road surfacing, are planned using TILOS directly. 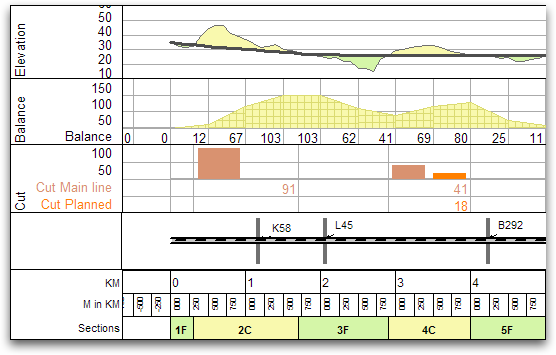 In this particular example, all non-linear work such as bridges were planned with Gantt charts and later integrated into the time distance diagram using the enhanced import and export options. Not all details were imported, just the major tasks using filters. They are shown as rectangles. The ability of TILOS to add various location graphics to the plan provides the ability to present much more information in the schedule than in any other system. 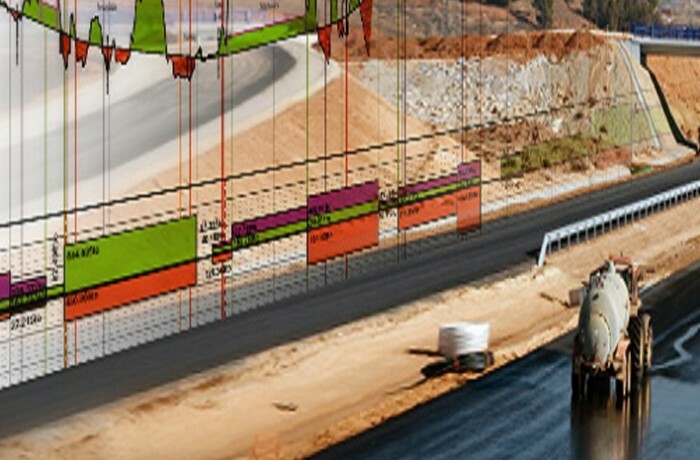 Site maps show the geographical information, while sketches of all tunnels, bridges and exits illustrate the work program. 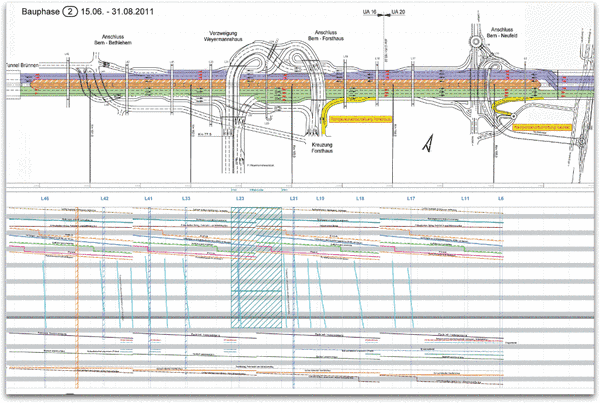 Elevation curves, mass haulage diagrams visualize the work quantities. TILOS can display information along the distance axis showing scales in different granularity. A station list shows crossing, culverts bridges or any important information that helps to understand and interpret the schedule, but also incorporates planning data such as quantities in different sections of the project. This data can be created directly inside TILOS, but can also be imported from Excel or text tables that already exist. For repetitive usage in various projects, we recommend preparing a standard template containing placeholders for all the objects that you wish to display. Later on when planning a project, all you have to do is to import the data to populate these cells. From Excel a datasheet can be directly copied into clipboard and then later imported into TILOS based on a mapping table. As soon as this is done, The graphic gets generated. This plan (see above) has been imported into TILOS from one single import. Elevation of the land and the road highlighting cut and fill by different colors. Mass balance curve showing cut and fill balance from left to right. At the end 11 300 m3 are left and need to be hauled away or used at another fill area. The cut diagram shows the quantities for cut in each sector. The second column shows how much quantity has already been planned in tasks. The next ribbon illustrates the distance axis with symbols. The distance scale is showing also sections and crossings. TILOS assists in getting overview on the mass haulage for your project by planning the activities for the cut and fill sections. It is not an automated process but rather it is the result of an interaction between user and the software. TILOS provides an overview, at each stage, about the current planning situation. TILOS compares the total quantities against what has been planned, along with the tasks and what has already been executed. At each stage you have an overview about your mass haulage situation. TILOS resource planning options fit the needs of the planners. In most planning systems the quantities are planned only on a resource level, TILOS handles the process quantity on a task level and can therefore it is much easier to calculate durations based on quantities and production rates, even without assigning resources. TILOS handles different resource types: permanent, consumable and complex. Permanent resources are used to plan labor and machines used in a project. The consumables are used to calculate consumption of materials based on customizable time slices to plan the logistics, but also to calculate the total quantities required. The complex resources are a combination of permanent and consumable resources. For example, assigning an excavator as a complex resource can include the operator, other specific equipment and fuel needed on an hourly or daily basis. Some resources can also be assigned as driving resources, which sets the task work rate and the duration of the task based on the quantity of work. For all other resources, the allocation is calculated based on the units/time value. In a mass haulage process, let’s suppose that the excavator is the driving resource. Based on the production rate and on number of assigned excavators, TILOS calculates how many trucks are needed to transport the material over a certain distance. Additionally, the soil installation process can be linked to excavation. On March 5, 2015 Trimble announced that it has acquired the developers of Tilos. Delta Solutions became a distributor for Trimble. Trimble's Heavy Civil Construction Division is a leading innovator of productivity solutions for the heavy and highway contractor. Trimble's solutions leverage a variety of technologies, including Global Positioning System (GPS), construction lasers, total stations, wireless data communications, the Internet and application software. As part of the Trimble Connected Site strategy, these solutions provide a high-level of process and workflow integration from the design phase through to the finished project—delivering significant improvements in productivity throughout the construction lifecycle. The addition of TILOS to Trimble's Heavy Civil Construction portfolio gives us the ability to collectively work on a more robust solution for linear infrastructure planning, execution and production control.